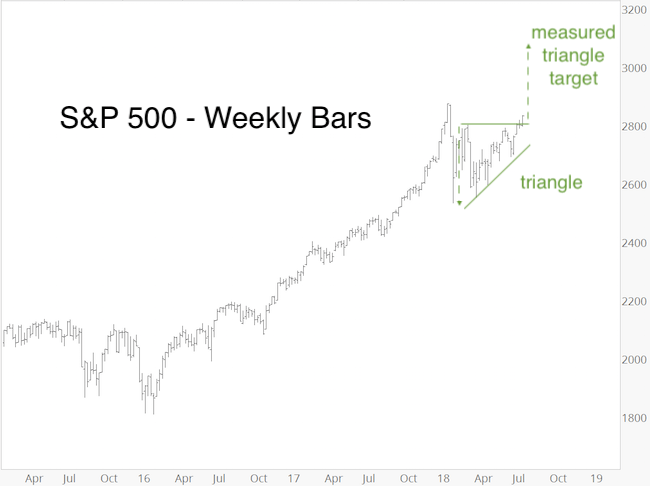 A couple weeks ago, I declared 2,040 as target and ‘make it or break it’ zone (Why 2,040? Is explained here). 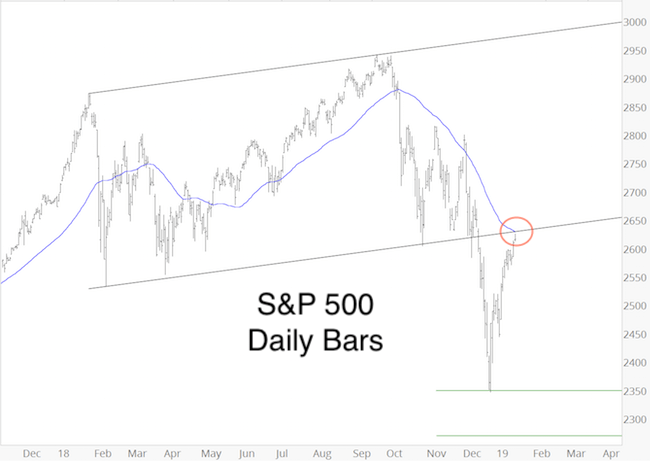 I realize this is a strong statement, and although the S&P 500 easily reached the 2,040 target, it appears like the ‘make it or break it’ zone was a non-event. Nevertheless, 2,040 actually did what it was supposed to do. How so? First, 2,040 acted as price target. The target was reached. 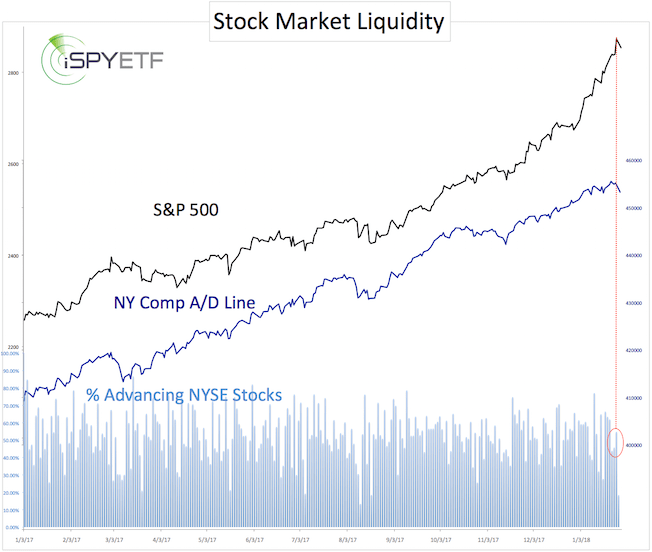 What does ‘make it or break it’ mean anyway? 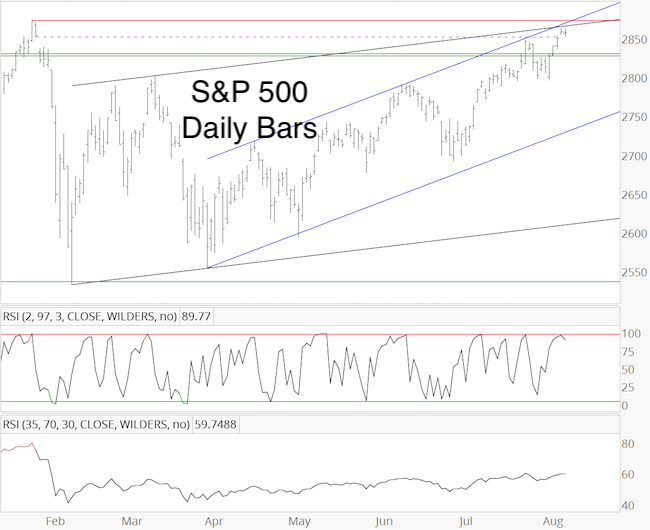 Second, 2,040 didn’t require a reaction, but market action around 2,040 would indicate whether the S&P 500 will break the August low (1,867) or not. 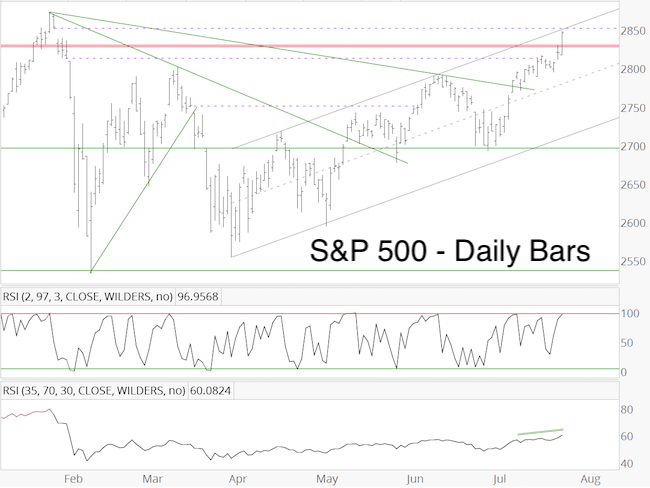 The S&P moved above 2,040, thereby diminishing the odds of another low dramatically. The S&P 500 made it. 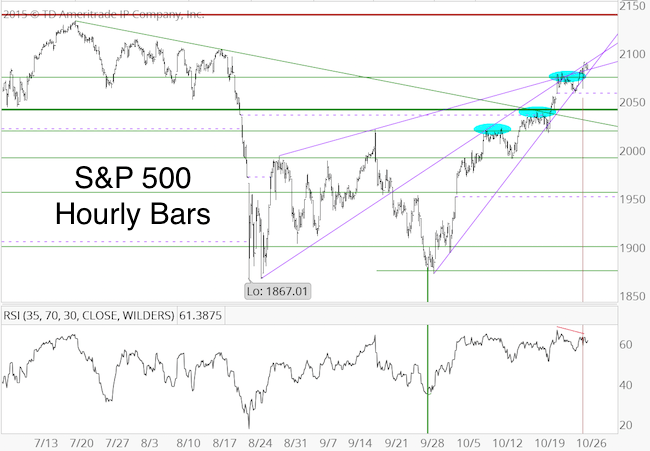 This doesn’t mean there won’t be a pullback. 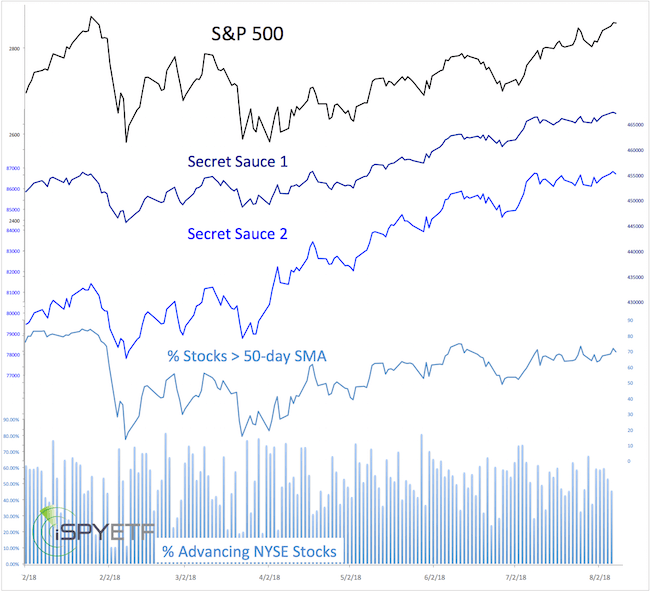 In addition to price, we’ve also been focusing on market breadth. Price is important, but it’s not the only thing that matters. To illustrate, an electric car can only deliver the full horsepower (or kilowatts) if the battery is charged. An empty, or near empty battery, won’t get the driver far, regardless of how many horses are under the hood. 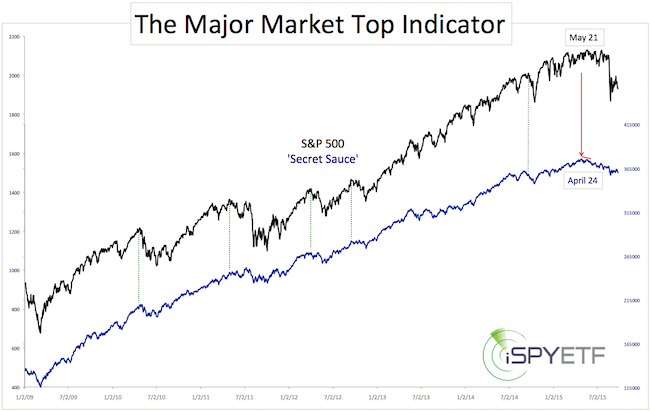 We wanted to see how things look under the hood as the S&P approached (and surpassed 2,040). Is there enough horsepower and battery life left to move stocks higher? 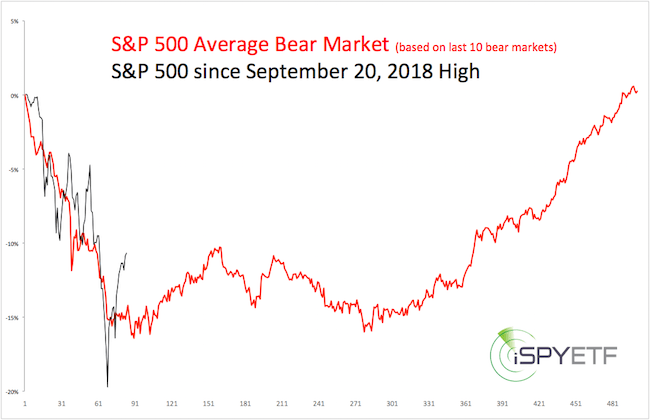 At times, market breadth was quite weak (especially on Friday, October 23). 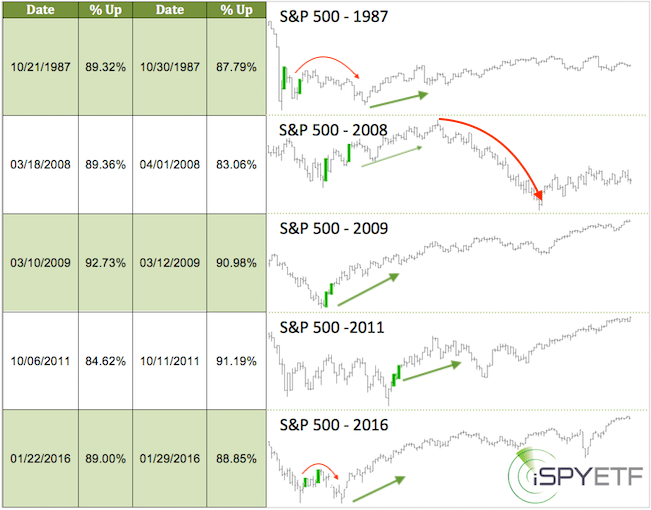 However, there were no bearish divergences suggesting a pullback. It would be a stretch to call the move decisive, but 2,080 was reached nevertheless. 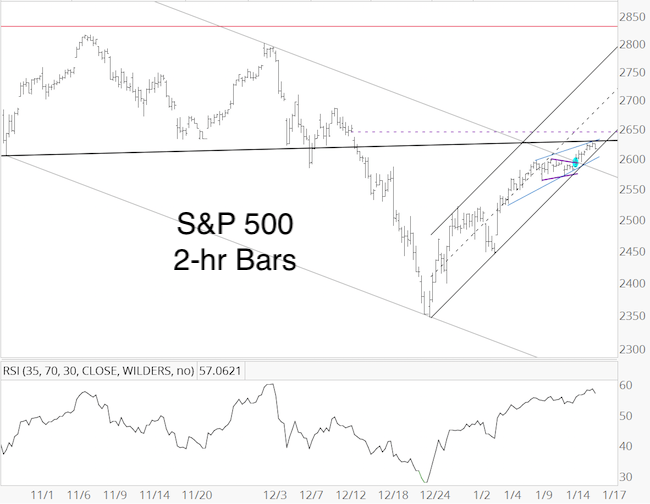 The hourly chart shows that the S&P 500 reached and eventually (after appropriate testing of resistance) exceeded all up side targets (blue ovals). 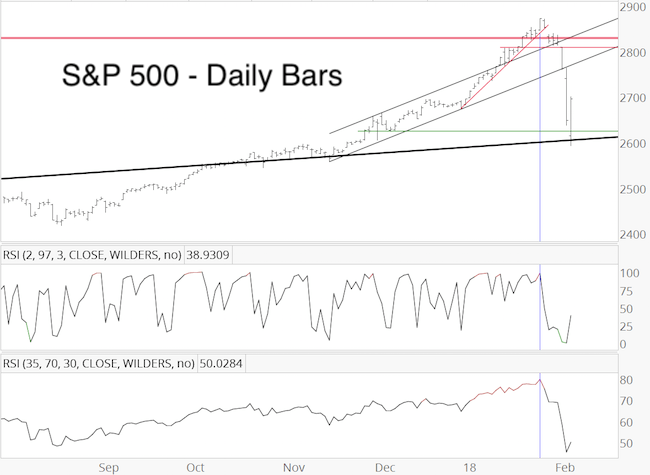 There was a bearish divergence at yesterday’s high. 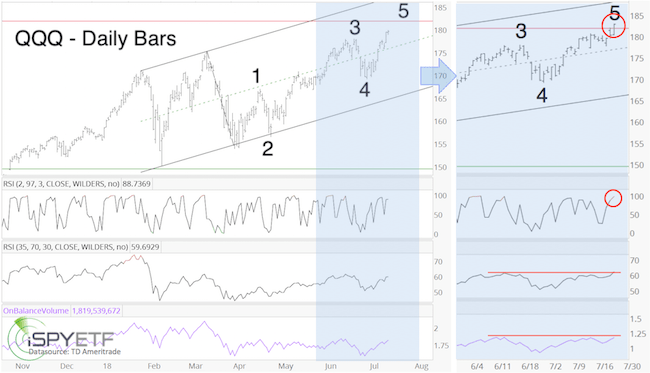 There is also trend channel resistance (going back to 2009) at 2,093 (increasing about 0.75 points per day). It will now take a new RSI high and a move above 2,093 (adjusted for time) to unlock further up side targets. 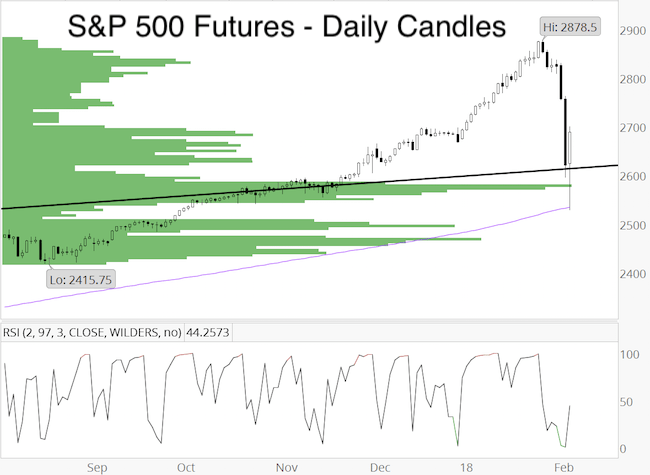 There is risk of a shallow pullback as long as the RSI divergence persists and trade remains below resistance. Based on real volatility – actual price movements, not the VIX – 2015 is the most volatile year since 2009, and thus far mimics 2011. 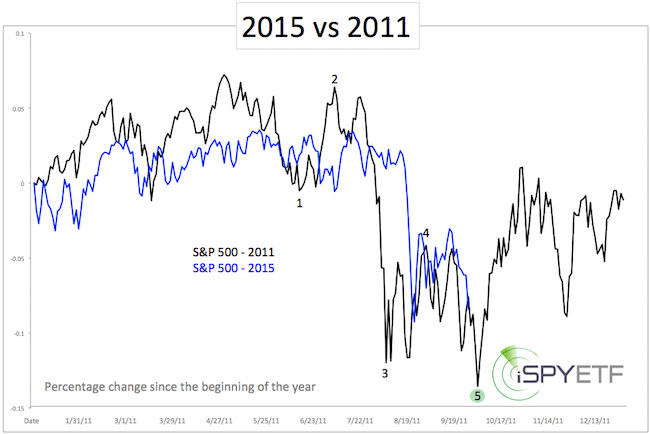 There are actually a number of similarities between the year 2011 and 2015. 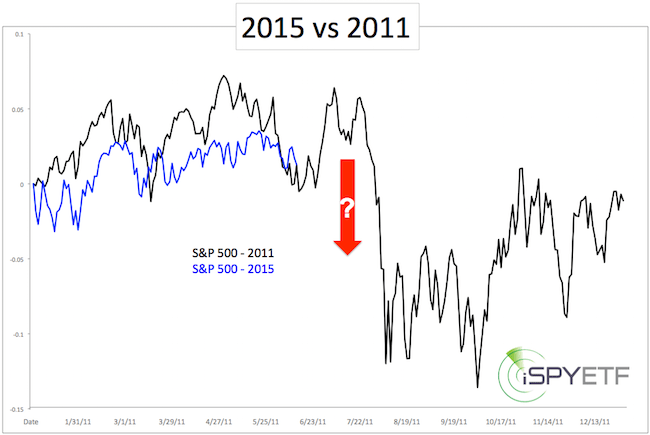 The S&P 500 fell 20% in July/August 2011. 18% of that loss happened within a 3-week meltdown. Could the same happen in 2015? 2015, like 2011 is a pre-election year. 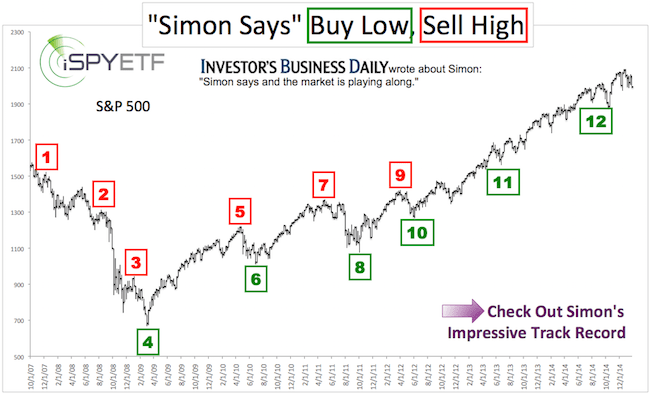 Thus far, the 2015 chart looks like the 2011 chart (see below). 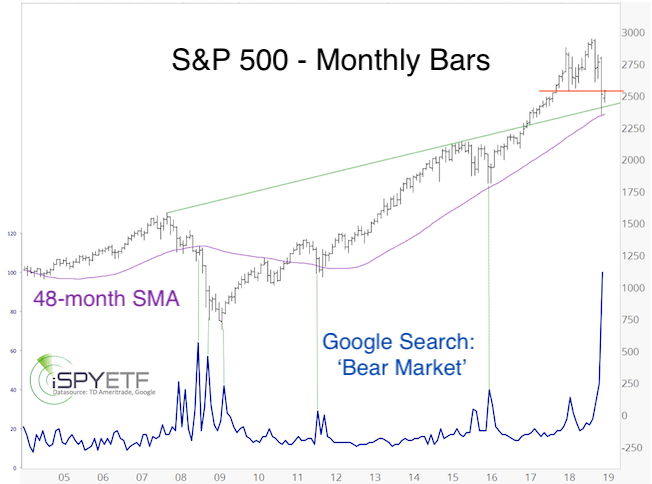 Stocks are internally weak right now, like they were before the 20% drop in 2011. 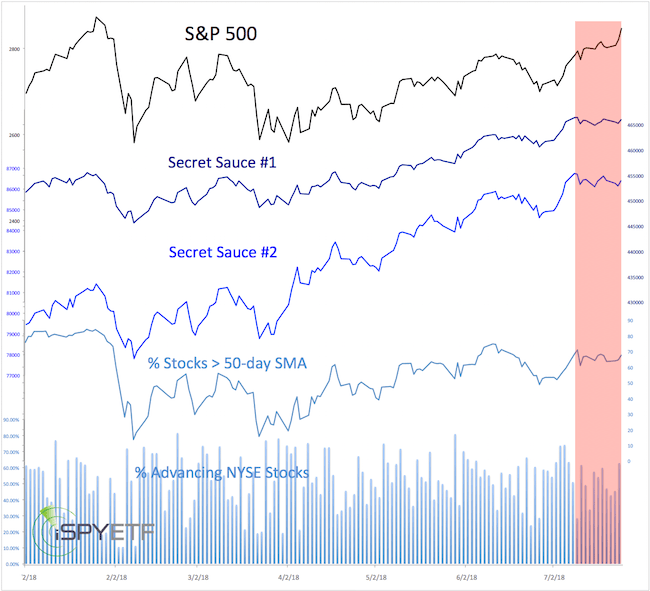 Internally weak in this instance means that more and more stocks are falling below their 50-day SMA despite new S&P 500 highs. 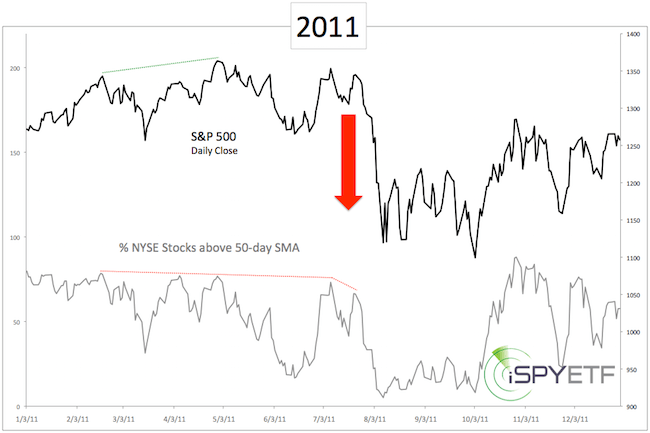 The first chart plots the S&P 500 against the percentage of stocks above their 50-day SMA in 2011. 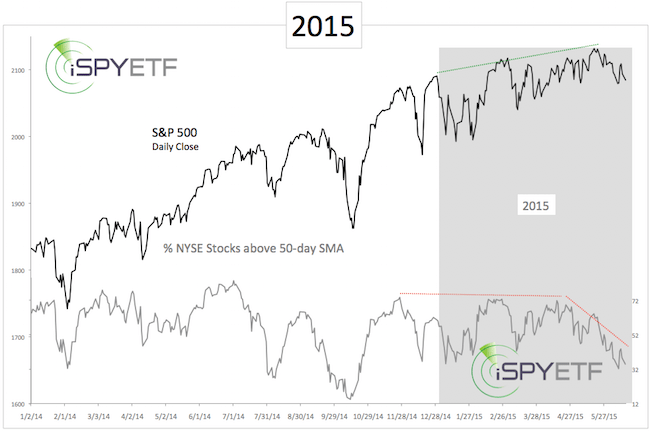 The massive 2011 July/August summer drop was preceded by several months of bearish divergences. 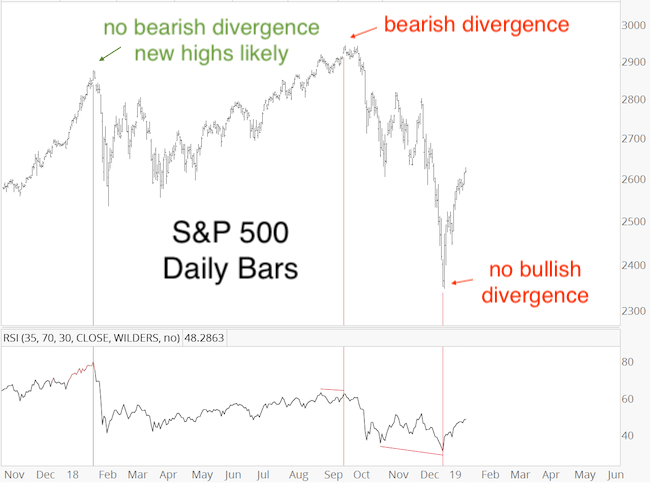 The second chart shows that similar divergences exist right now. 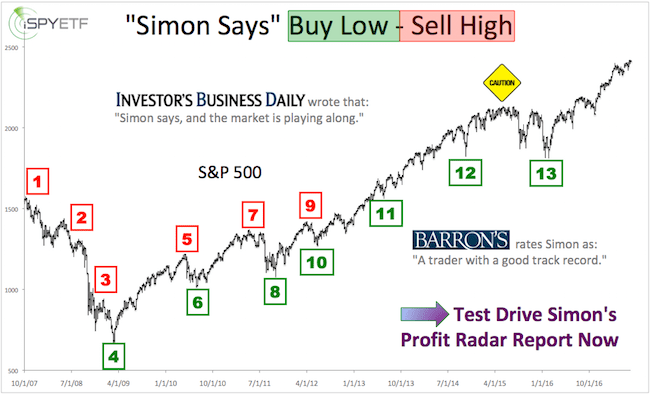 The third chart compares the S&P 500 of 2011 with the S&P 500 year-to-date. If the analogy holds up, we’re in for a wild ride (up, down, up), but no net progress at the end of the year.